As a medium, video games have evolved a lot. In the early days they were simple forms of entertainment, but now they are even more. As consoles’ capabilities have grown, the works of art that game developers can pursue is incredible; games are not always about fun, because now they have meaning that can affect the player in profound ways. Developers can build stunning visuals that are awe-inspiring, and through this can find unique ways to build a story and tackle difficult subject matters in interesting and exciting ways. Thus another Video Game Spotlight, a series in which I talk about different games, attempting to spread some light onto random, independent games I stumble across. For this entry, I write about Bound, brought to us by developer Plastic and published by Sony. This game is a beautiful piece of art housing a story of struggles while coming to terms with people’s actions, all from an interesting viewpoint. Bound places us in the shoes of an unnamed protagonist, switching back and forth between the real world and the world constructed by the character. The real-world sections follow a pregnant woman on a stroll down the beach stopping at random chairs to browse her book. The book contains pictures representing the woman’s real childhood struggles, telling different stories that represent a form of escapism whereby she can deal with the struggles in a creative way. This escape is the world of her imagination, where she is the princess of a kingdom under attack by a monster, and must venture through the world to face the truth of her struggles. Where this game shines is in its visuals; there is a consistent twist in the design to represent the struggle of the moment. As an example, the essence of someone being burned plays out with fire being a consistent theme, or something being broken leaves a series of dangerous branches or ropes all through the world. To face the danger, the princess handles things in a way that empowers her: dance. This is a key part of the movement system as every movement is a form of dance flowing with the beauty and freedom of rhythmic movement. All the dangers in the world are overcome by dance, it’s a freeing movement for the character, a means of being safe, and when you do something you love, nothing can touch you. This seems to be the message Bound provides, as you dance through all dangers unaffected by them. There is freedom and relief in your imaginary world. The game plays out in a series of small levels where you run from point A to point B, and along the way you deal with basic platforming. This element has come forward as a regular complaint about Bound, yet it never feels like a problem. The design is simplistic, but that seems like the point. 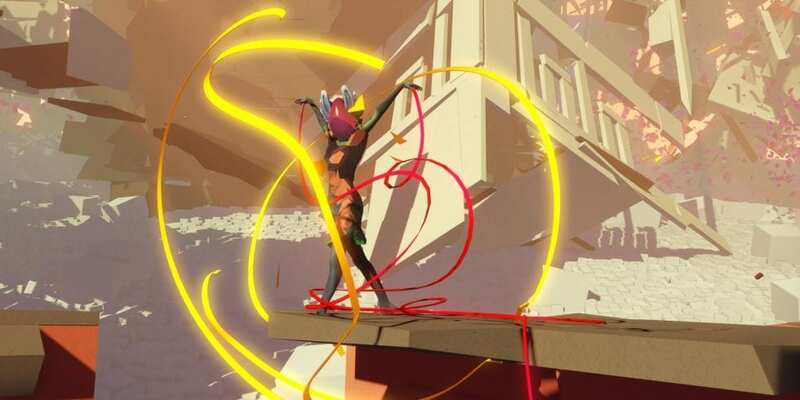 Bound is focused more on its movement than its platforming. It’s also a minor element when compared to the narrative being told, and the fact the developers have more interest in you watching the world rather than platforming says a lot about the value of this design and its importance. Arguably this stance on game design does work. In playing Bound, you often find your eye drawn to the stunning backgrounds and evolving world. Focusing on platforming would be difficult with such distractions, although what is there is fine. It adds a certain challenge that is appreciated and never feels cheap. Any failures made in these sections are on the fault of the player, never the design. With Bound the art direction is always interesting, especially when partnered with the stunning musical scores that tie in wonderfully with the level design. There is a magic to scores that makes moments stunning, that captures your fancy and pushes you onward to uncover the greater narrative at play. It was hard not to feel at peace as you traveled through the stunning levels, but there is also an air of sadness. The story within Bound keeps you guessing in a way I didn’t expect. I already had an idea for how the game explored the ideas of escapism, but as the story unfolds regarding the character’s past and her greater questions she wants answered, Bound becomes very real. The fantasy elements of the princess are merely coping mechanisms for the woman to tell her story, but the greater meaning hits you like a truck in a very effective way. I constantly guessed where the story was going with new paths taking me in different directions, but I couldn’t guess where it would end. The story of Bound will impact its players in profound ways; whether they have experience with the subject matter or not, it will most likely leave you thinking for hours after gameplay has wrapped up. If you are not into artsy games, then Bound may not be your cup of tea at first glance. At face value, this game may not seem like much, but once you look deeper, the game has a lot to offer. Bound will have your interest as its story unravels, and that is the quality of the experience. This continues to show why games are forms of art that can tell powerful stories with unbelievably strong messages.